Board of Directors Make the instruction and set the target according to the situation of group. Audit Committee Supervise the sales, finance, the validity of financial statement and the implement of internal control. Remuneration Committee Set the revenue and performance evaluation policy of directors and managers. Pay the salary of directors and managers. Review the policy periodically. Internal Audit Department To obey the regulations of competent authority and company regulations, do the internal audit of company’s operation and provide suggestions of improvement. Business Department Sales Department In charge of market information collection, overseas customers relationship and orders. Customer Service Department In charge of order chasing, shipping, checkout and the information delivery between customers and sales department. Financial Department Raise the funds, supervise and analyze the operation situation, make the financial report and budget report. R&D Department In charge of development and patterning of new products. Rule the bill of material(BOM) standard. Manufacturing Department The implement and planning of production program; in charge of production related matters like framing, crafting, painting, cover cutting, sewing, assembling and warehousing. Purchasing Department In charge of managing and maintaining relationship with suppliers; In charge of price comparing and purchase of material and equipment according to production plans. 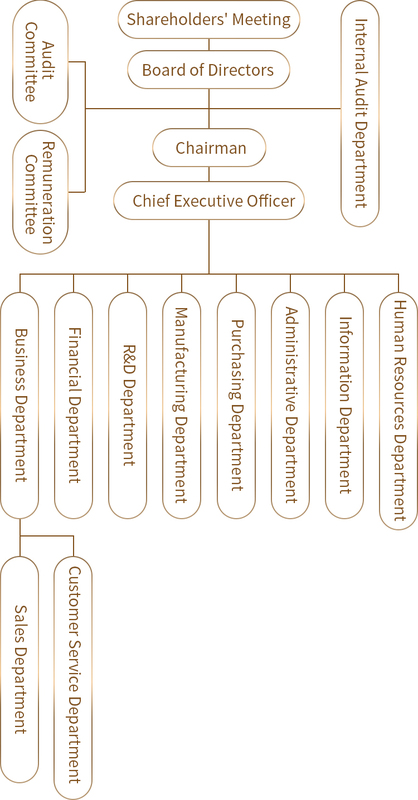 Administrative Department In charge of administration management like general affairs and safety. Information Department In charge of the maintain and management of electronic services and ERP system. Human Resources Department In charge of employee management, training and compensation policy.